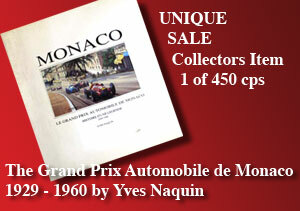 Once upon a time in Monaco..
With the pop down menu at the top of the page, you can navigate to any page of the website. The PADDOCK menu on the right leads to other aspects of the Monaco Grand Prix and also the discussion forum. Do not forget to donate images, video, text or just a bit of money to this site. Everybody seems to forget this!! Any donation is very welcome to keep this site going. OR EVEN JUST CLICK SOME ADS, IT HELPS US. 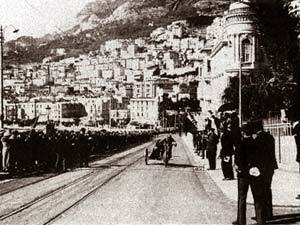 The very first automobile race for Monaco was held in January 1897: the Monaco - Marseille - Monaco. 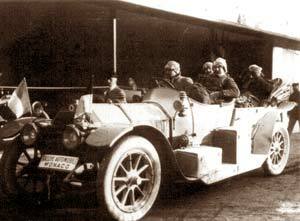 The winner, Monsieur De Chasseloup-Laubat drove the distance with an average speed of 30,06 km/h. Monaco has always been embracing the automobile and already in 1920 created from the bicycle club, the automobile club. The driving force was Alexandre Noghès and his son Antony Noghès, who imagined and created the world famous Rallye de Monte-Carlo, which was first held in 1911. Following this event, many automobile agility, hill climb and other competitive motorised events were created during the 1920’s. In 1928 a small committee was formed, presided by Antony Nogès to organize a ‘Race in the City’. For months studies were made for a circuit in the town. Many citizens and shopkeepers were against this crazy idea that would upset their lives forever. When they were offered compensation from a special fund, the residents reluctantly came to see the race and moreover the accidents that were bound to happen. In the presence and under the patronage of H.S.H. 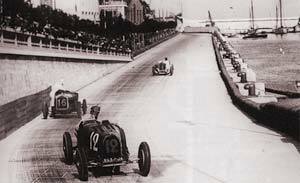 Prince Louis II the first Grand Prix Automobile de Monaco was run in the streets of Monaco in April 1929. The organization was close to perfect, special pedestrian bridges were erected and stands with seats for the public. And… there was not a single accident. The spectators were enthused and so were the drivers. The prizes consisted of: the winner; the cup of H.S.H. the Prince of Monaco and 100.000 Francs, 2nd 30.000 Francs, 3rd 20.000 Francs, 4th 15.000 Francs and 5th 10.000 Francs. Also for every 10 laps there was a prize of 1.000 Francs for the leader and 3.000 Francs prize money for the lap record. From then on the Grand Prix Automobile de Monaco was held every year, with a 10 year pause from 1938 to 1947 and some years were jumped for various reasons in the 50’s ('49, '51, '53, '54). The average speeds have grown from 80 km/h in 1929 to 170 km/h today and the cars have evolved from being hand built mechanical works of art, to hand build master pieces of space technology. The circuit has changed many times over the years, but still consists of fairly narrow streets, lined with crash barriers, with no view and no space for any mistake. Monaco remains the most prestigious Grand Prix event and winning in Monaco is still the cherry on the cake for every driver. After having invested quite a substantial (hurrendous) sum of money, not to speak of time and effort, I have been providing the Monaco GP Library for over 10 years free for all. I believe work needs to be remunerated. This still is the most comprehensive site about the Monaco GP (sorry I cannot show any video after 1984 for rights reasons). Please send a donation no matter how small or at least clic on the advertisments. 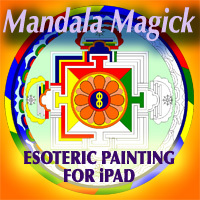 My other websites you can find HERE. Send us even a very small donation to keep this site going. video and photo credits : SBM archives, Alfa Romeo Storica, Mercedes Benz Museum, Ford UK, Instituto Luce, Pathé, INA, TMC, SAMIPA, ABC Sports, Stéphane Quinson, Zagari Photo Archives, Roy Hulsbergen. All rights reserved to the respective owners of the copy rights. None of the contents may be copied without the express written agreement of the authors or copyright holders.